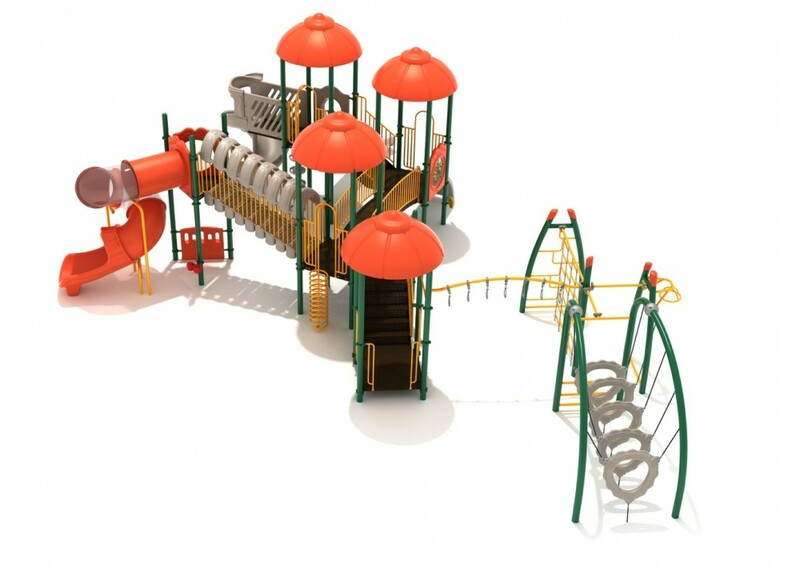 The Pantigo play structure is like an obstacle course for children to weave in and out of. Children will exercise their athletic ability with a t-section attached to one side by a curved overhead swinging ring ladder. A chain climbing wall, maze rung vertical ladder, overhead spinner, and floating tunnel climber that make up this section will keep children physically fit. 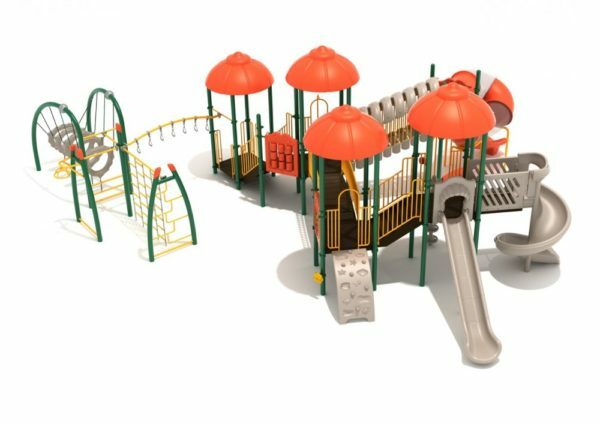 Children can take the curved overhead swinging ring ladder of this section to the main structure. There is also a spiral, a sea creature, or a pod climber children can use to get on the structure. An arch bridge connects two parts of the structure that jut out. On one part children can climb up an incline covered bridge before sliding down a spiral tube slide, on the other side children can climb stairs and can either go down a straight or spiral slide. The Pantigo play structure is ADA compliant with features such as a rain wheel, bongos, and tic tac toe panel. This structure is designed for children 5-12 years of age. The Pantigo play structure is like an obstacle course for children to weave in and out of. Children will exercise their athletic ability with a t-section attached to one side by a curved overhead swinging ring ladder. A chain climbing wall, maze rung vertical ladder, overhead spinner, and floating tunnel climber that make up this section will keep children physically fit. Safety Zone: 49'11" x 54'9"